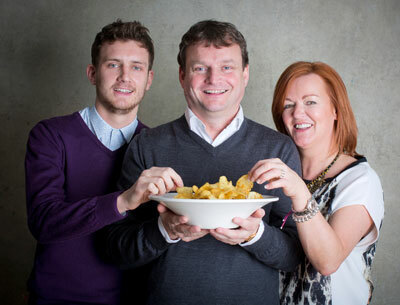 When Liverpool crisp entrepreneur, John Tague launched his own range of crisps he decided to involve his whole family. John, the former MD of Seabrook Crisps, who took the brand from £11 million turnover to £30 million, created TAGS Tasty Crisps earlier this year. Tags, John�s childhood nickname, is very much a family business. Apart from John, wife Clare and their four children, Patrick (26), Joe (25), Dominic (17) and Cecilia (14) are all involved in the company which is based in Liverpool. Cecilia takes care of the brand's Social Media. She is a pupil at Liverpool College and was initially involved with concepts for the packaging. She says, "I started off calling in lots of different crisp samples and analysing the different packaging. I thought it was really important to look like a quality brand." "Now I�m in charge of the brand�s social media and set up and maintain our Facebook and Twitter account. I�ve grown a thousand followers on Twitter in the past five months and I love it when something I hashtag starts to trend. I�ve even taught my mum to Tweet and we�ll sit on the sofa after homework�s done and post up new messages to our followers." "I�ve set up regular competitions where I reward the best pictures of Tags Crisps taken by our customers with a free box of crisps. It�s great when we get new followers and retweets and I really enjoy seeing how people engage with the brand. It makes me feel proud when people tell me how much they like the crunchy Tags taste compared to other hand-cooked crisps." "Over the past year I�ve seen how hard it is to start a business but what I�ve learnt has focused me on my own career. When I�ve finished in education I�d like to work in social media." Dominic made Business Studies one of his A Level choices as a result of working in the family business. He made the business� legendary first sale � a total of 84 packets to raise money for his school and may end up heading sales in the future. "I spent the summer working with my 25-year-old brother Joe who is in charge of sales and marketing for Tags," said Dominic. "Every day, we drove a van full of stock around Liverpool leaving samples for shops, bars and retailers to try and dropping off orders with new customers. "I learnt so much that I�m determined to run my own business own day. I�ve seen how many hours you have to put into a business to grow it and start getting results. You can have fantastic days when everyone you see places an order, but others when you�re out in the pouring rain and nothing seems to go your way. I�ve seen how important it is to fulfil deliveries on time and to arrive with a friendly face and plenty of sweet talk!" "My dad is very fair, but he doesn�t stand any messing. I think if you work in a family business you really work hard. I work as a waiter in my mum�s restaurant as well and I feel proud that we�re all helping each other." John�s vision is for a business that will help change the lives of young people, giving them business and entrepreneurial skills, just like his own children have learnt from him, working with local people, suppliers and charities to share in the success of a dream he strived his whole life to make reality. "We have created a unique new brand to challenge the more established brands in the market," commented John. "Our branding is deliberately aimed at capturing both today�s and tomorrow�s consumers." "Our crisps are produced using the finest ingredients to ensure you always experience products that are bursting with great flavour and taste. The products we have launched so far are only the start of our journey as a family business. Over the coming months we intend to introduce further flavours and also extend into other snack products." Joe is the number two at Tags and works closely with his dad. He says, "I love working with my dad. We discuss all elements of the business from meeting major retailers such as Asda to selling Tags from our crisp van to customers in Liverpool and the North West. 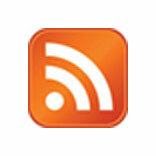 I�m also involved with the marketing side of the business and responsible for creating a new website." Patrick is responsible for all the company finance activities, ranging from management accounts to preparing annual accounts and ensuring all suppliers are paid on time. 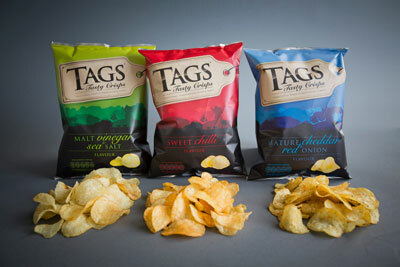 Currently travelling in Australia, he has taken samples of Tags Crisps with him to gauge interest in export for the brand. Mum Clare says, "I�m really proud of my family. We�ve always encouraged the children to develop business acumen and be committed and reliable. The boys started off doing paper rounds, graduated to helping in the family restaurant, Pod in Allerton Road, and are now heavily involved with building the Tags brand." Over the past few months, listings have been secured with Tesco, Poundland and B&M stores as well as an increasing number of outlets in Liverpool and the North West. John says, "I�m really proud of my family and how hard they all work. We�ve had a phenomenal success in the Liverpool area and customers like the fact that we�re the city�s only crisp company."